I’m shooting hoops at the playground in the schoolyard around the corner from where I live in Forest Hills, Queens, when I see a young mother pitching a baseball to her son. He’s probably about 8 years old. She lobs the ball toward him, but it goes nowhere near the strike zone. The boy frowns with serious purpose and swings wildly, missing. Again and again she pitches off-target and again and again he strikes out. I amble over to the mother, as nonchalantly as I know how, to offer my services as a relief pitcher. My father played catch with me only once as far as I can remember. We went out on our front lawn and tossed a baseball back and forth, each throw smacking loudly into our mitts. That summer afternoon, I felt about as happy as I’d ever felt. That’s just how it goes when you’re 8 years old and playing catch with your dad. But then my father got busy with work, too busy to play catch with me anymore, always leaving early in the morning and returning late at night, and that turned out to be that. He had to do what he had to do. He was also born deaf, creating an extra barrier between us, and tended to keep to himself. I promised myself everything would go differently with my own son and daughter. We tried pretty much every major sport together – baseball, basketball, tennis, soccer, you name it. We flung around Frisbees. We raced in sprints. We saw who could swim underwater the longest. It went great. But then our kids turned into teenagers and young adults. They moved on to more independent physical pursuits – push-ups and jogging and such. And once again, that turned out to be that. Play has always meant the world to me, even as a so-called adult. So now, if I spot a kid who evidently needs to play, I am happy to oblige. Once, my wife, son, daughter and I went to a Thanksgiving dinner our friends held in our neighborhood. Halfway through the feast, the oldest son of our hosts, in high school at the time, looked as if he had mingled quite enough with all the grown-ups at the table. As it happened, so had I. Knowing him to be a serious athlete, I invited him to have a pass with a football in the street in front of the house. Out we went into the November night, shrugging on our overcoats to shield us from the chill. We flipped passes to each other for who knows how long. Clearly, I suffer from an acute case of Peter Pan Syndrome. But just as clearly, I’m ever-ready to answer my calling as a Pied Piper of play. So it went last August when my wife and daughter and I took our annual vacation in Mystic, Conn. One afternoon, as we sunned ourselves by the pool at the motel, a boy about 10 years old left the lounge chair next to his mother and slid into the water. Soon, clearly bored, he started to toss a tennis ball in the air to himself. I joined him in the pool and held up my hand to signal for him to toss me the ball. We played catch for the next half-hour, throwing the ball back and forth, the kid smiling the whole time. It perfectly fit my lifelong definition of fun – an activity spontaneous, absorbing even therapeutic. A short time later, I realized that in a sense I already do. Playing catch, after all, is a dialogue, a conversation, a connection made. Every school had meant new classmates and new teachers, every job new colleagues and clients, every backyard barbeque new friends and acquaintances, every neighborhood new tenants and merchants, and every basketball court new teammates and opponents. I’d always, after a fashion, played catch with strangers. Playing catch with kids is a job I still covet, even though I’m now eligible for Social Security. Play is a language children speak fluently. 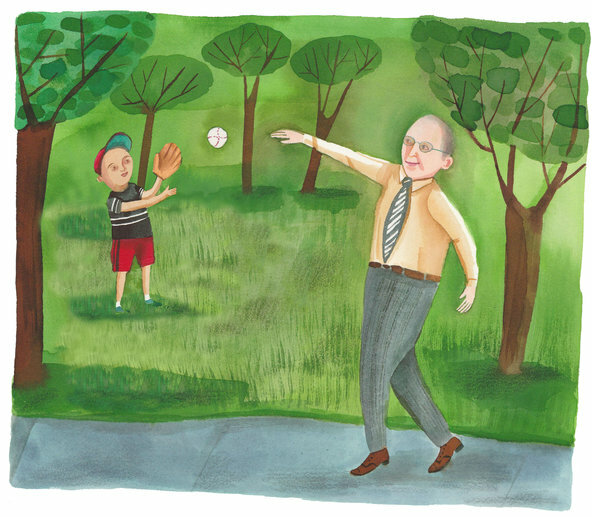 Every time I engage in a sport with kids, I’m in effect re-enacting that catch with my father on our front lawn and those games I played with my kids. I feel, if only for a few moments, restored to my roles as father and son, connected both to the boy I used to be and the father I’ll always remain. Back at the playground now, I pitch the baseball right down the pipe and the kid belts a shot into left field. His mother drops her jaw in disbelief. Then the kid clubs another blast even farther. He’s walloping every pitch all over the playground, smiling now, proud of himself. I go back to shooting hoops and hear a Mr. Softee truck pull up to the curb nearby, its familiar jingle a siren song drawing children and parents. And a minute later, the same kid, now probably feeling rather like a future Hall of Famer, walks over to me bearing an important message from his sponsor. I picture swirls of creamy chocolate piled on a cone and feel a twinge of earthly desire. But I decline. I’ve already had my treat. Bob Brody is an executive and essayist in New York City. This essay is adapted from his memoir, due out next June.